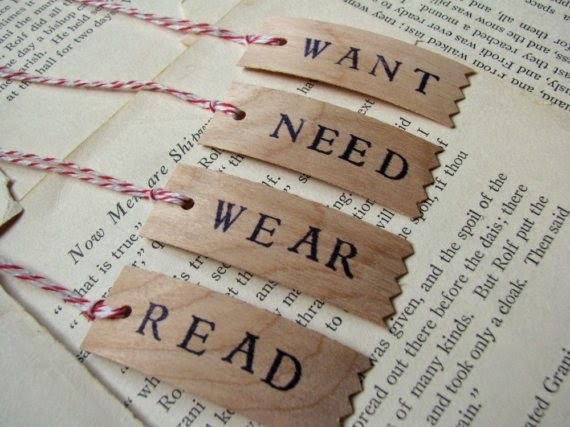 I love the idea of four gifts: something you want, something you need, something to wear, something to read. But I'm struggling with ideas for Jane's presents for this year. Jane has everything she needs, and honestly more than she wants. We have toys coming out our ears, books by the dozens (hundreds?) and enough clothes (and underpants!) to last at least a couple weeks between laundry days if we really wanted. When I ask Jane what she wants for Christmas lately she's been saying "books!" I've already squirreled away about 5 new books for her, plus we do our book-a-day Advent tradition so she'll get to revisit and rediscover all our Christmas-themed books. Her birthday is just six weeks before Christmas, so she's still got the newness of her birthday presents. I know in years to come she'll get into the cycle of greed and won't have any trouble answering the "what I want for Christmas" question. I'd been thinking about a balance bike or something similar - a big gift that could get a lot of use and be helpful for gross motor development. But a problem with something so physically big is that she couldn't open it ON Christmas because we won't be at our house and I can't deal with the shipping. And for something to wear I could buy her a fancy party dress or a new pair of PJs, although really she's got all the PJs she'll need for the winter and she has a lot of dresses (although most are getting too short -- she's very tall). And there's really nothing she needs because I just fulfill needs as they come up (for example this week we bought three packs of underwear -- including Ninja Turtles!! -- because I was getting tired of stressing about whether I'd done laundry soon enough to make the seven pairs that fit last). I also don't want to have a bunch of stuff to cart back home from our Christmas trip. Hrm. Maybe I should just go with a books-only gift from us plus a stocking with various little things for her, because I L-O-V-E stockings!!! (It was so hard when I was away from home/with Shawn's family the first year and didn't really get one. But now I just do my own, which is almost as fun!) For Jane's stocking I already have a few Target clearance toys that can fit plus some random kids meal toys I've procured, new crayons and stickers. We don't "do" Santa Clause, but stockings are awesome.